Meet my latest addition: stereographs. A few weeks ago I found an intriguing stall in Washington’s Eastern Market and I was hooked after searching to my heart’s content through hundreds of amazing, century-old images from around the world. 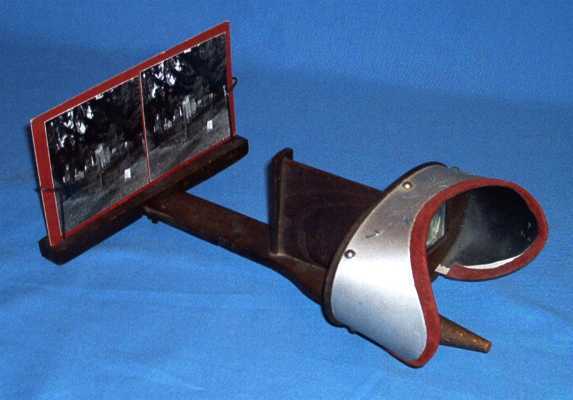 Before iPads, TV, and movie theaters there were stereographs. It’s a simple yet brilliant concept: a special camera took two images right next to each other, shifted slightly just the way the image that our two eyes see is shifted. The effect? When you look at a stereograph through special binoculars – a stereoscope – the image becomes 3D! Basic optics, magical result. 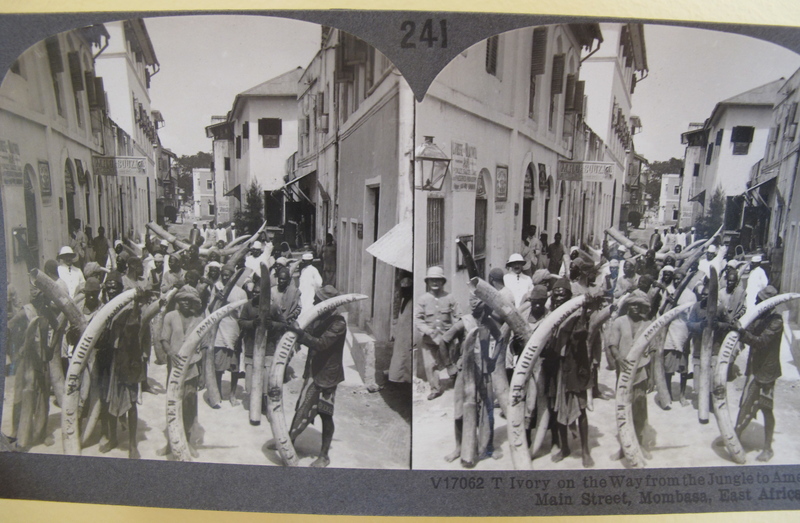 In the late 19th and early 20th century stereographs were the craze. They were a way to see famous and exotic places come to life in a way that no ordinary photograph could create. They reigned supreme until the arrival of moving pictures but still today have a devoted crowd of enthusiasts – counting me. The Keystone View Company from tiny Meadville, Pennsylvania became a world leader in the industry and left a legacy of thousands of priceless images that still “pop” today and amaze the way they did a hundred years ago. 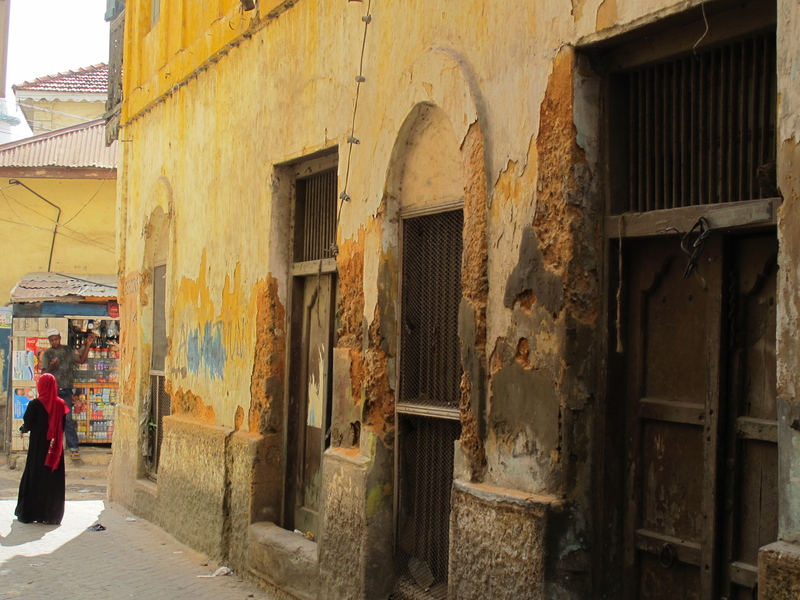 Here is one that especially captivated me: old Mombasa. Fortunately ivory trade is no longer going on – or at least not legally – but Mombasa remains the region’s busiest port. While walking through the narrow streets of the Old Town it is easy to squint your eyes and see that stereographic image. 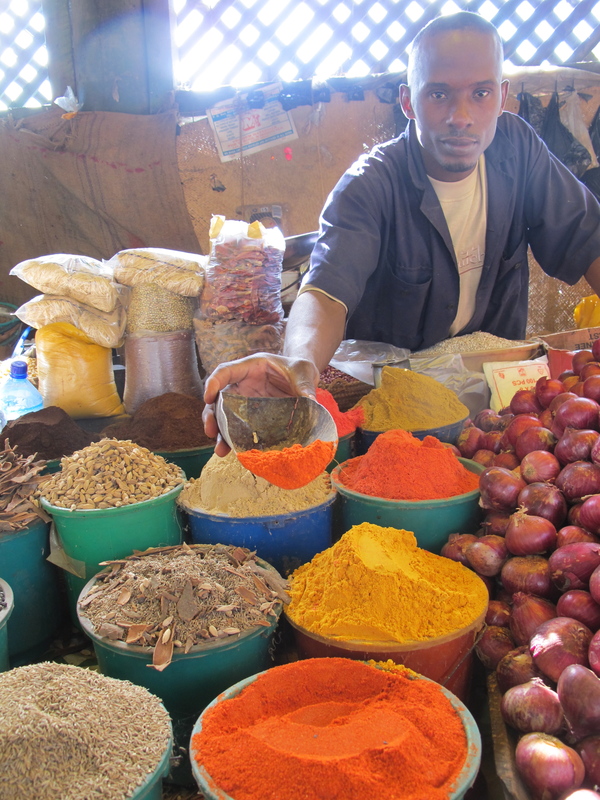 Instead of ivory, fresh fish, fruit, macademia nuts, fragrant spices, colorful fabrics, and abundant souvenirs fill local markets and hole-in-the wall shops. 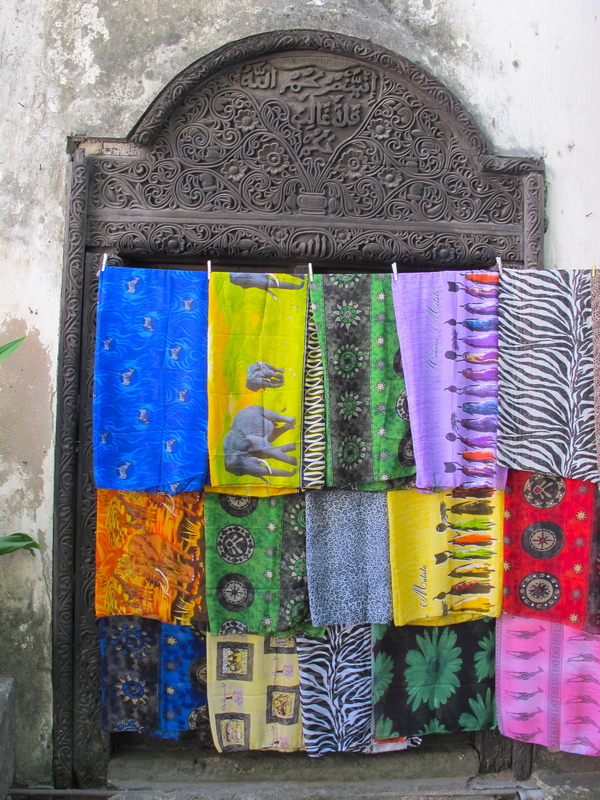 Yet, the same salty ocean breeze brings respite from the heat, the same elaborately carved doors guard the privacy of ancient homes, and the same muezzin calls pierce the street-level hustle and bustle from lofty minarets. 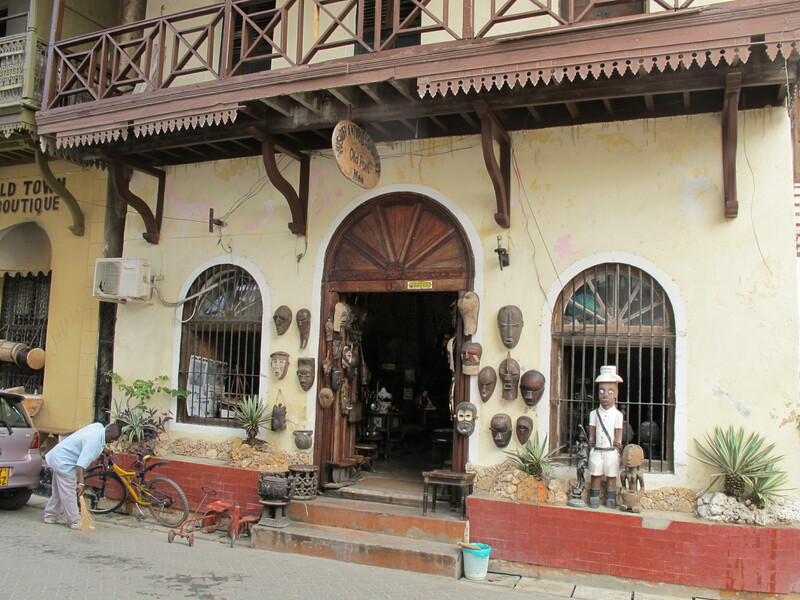 With its unique history, Mombasa is like no other city in Kenya. Vasco da Gama first visited the place in 1498 on his way to India (but wasn’t particularly welcomed). 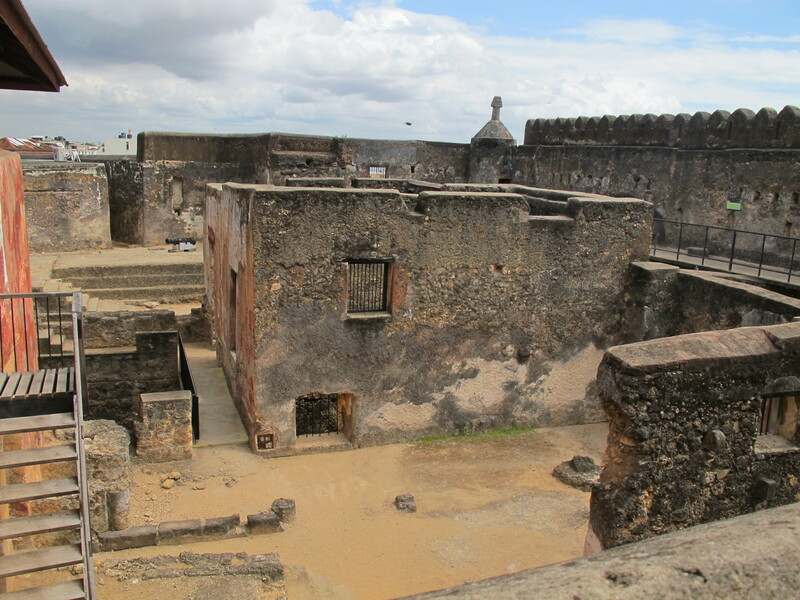 The Portuguese eventually established permanent presence and in 1593-1596 built Fort Jesus, a UNESCO site which still anchors the city’s ocean front. The Portuguese saw themselves as representatives of Christendom and sailed under the flag of the Order of Jesus – hence the new fort’s choice of name. Viewed from the air it has a curious shape of a man, arms outstretched along the coast, head touching the ocean, always on the lookout for enemy ships. 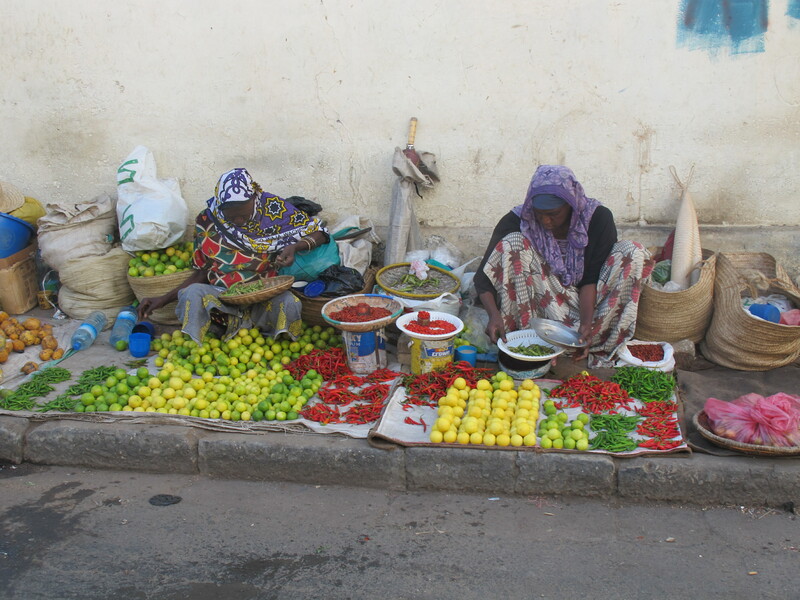 In 1698, Omani Arabs took control of Mombasa and it functioned as an autonomous entity governed by the influential Omani clan, the Mazrui family. 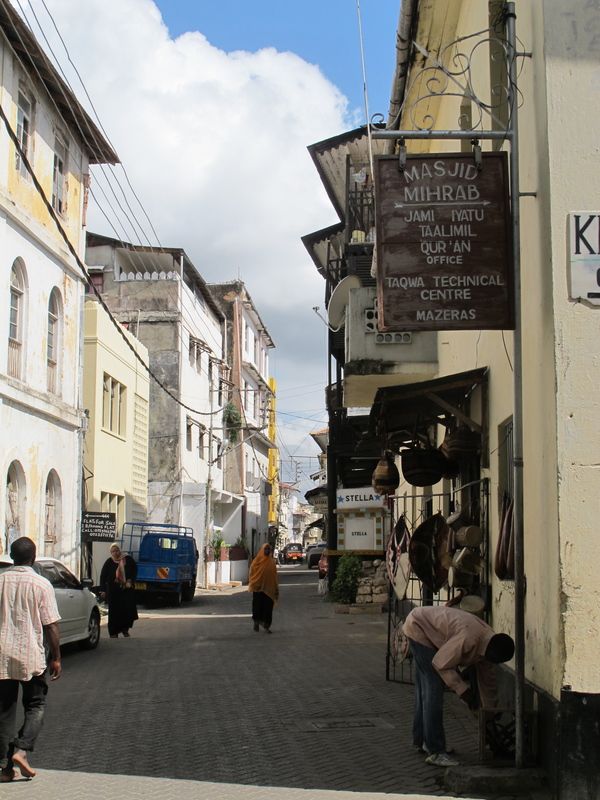 The British arrived in the 1820s and after protracted power struggle the Sultan of Zanzibar formally relinquished control of Mombasa in 1898 and the city became the capital of the British East Africa Protectorate until Kenya’s independence in 1963. 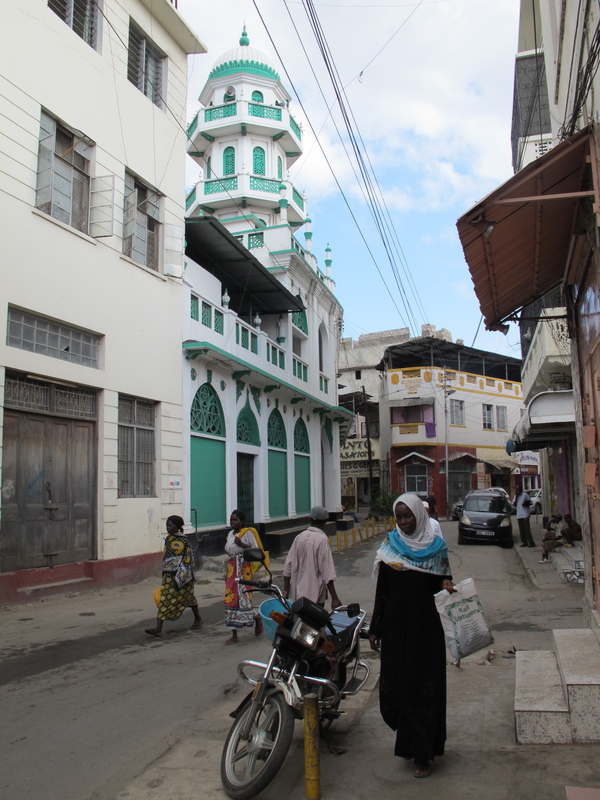 As a result of these complex political, religious, and ethnic influences, Mombasa today is a vibrant Muslim majority city in otherwise predominantly Christian Kenya. 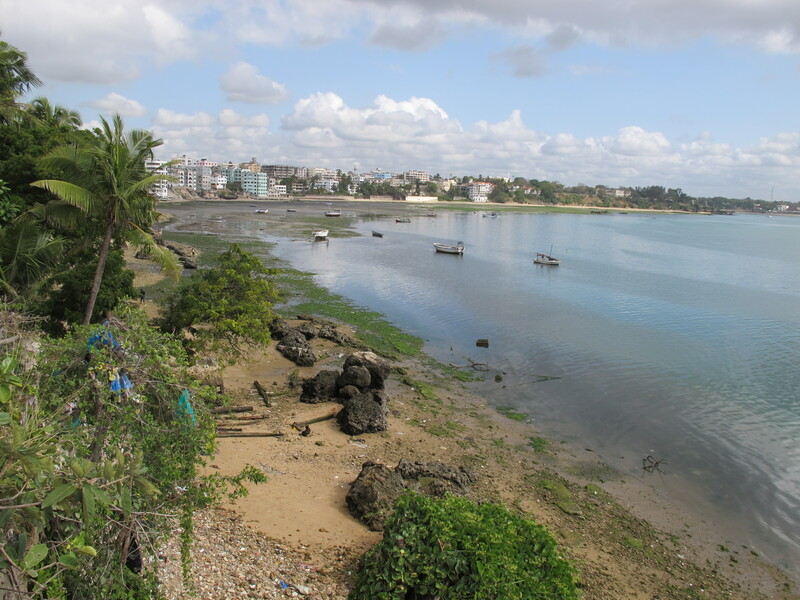 Descendants of Omani Arabs mingle with indigenous Swahili speakers, Indians whose ancestors came under the British rule to build the railroad, and of course scores of sunburned mzungus (foreigners) flocking to Mombasa’s exquisite beaches. 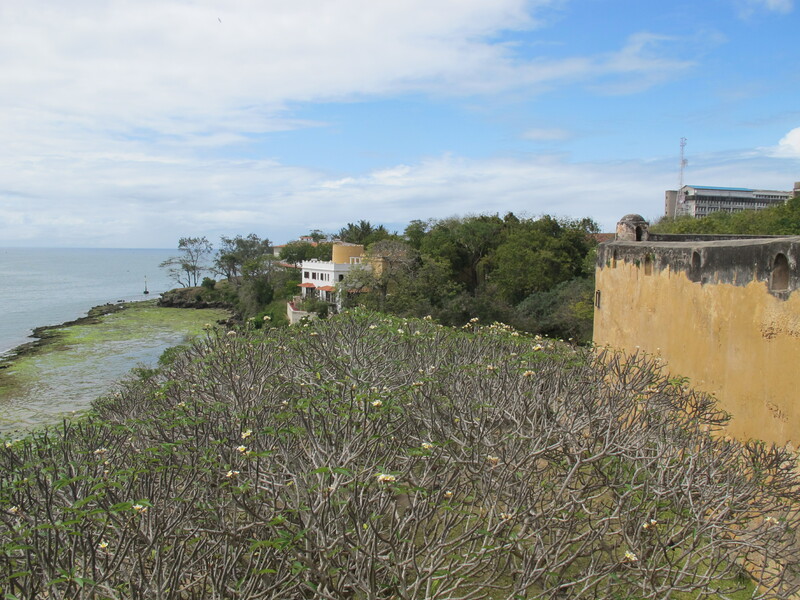 This history – combined with the influence of instability in the neighboring Somalia and the issues of economic inequity – makes Mombasa susceptible the kind of trouble that erupted in full force back in August. After an assassination of a radical Islamic cleric Aboud Rogo Mohammed by unknown attackers, the city’s frustrated Muslim youth rioted for several days, burning churches, looting stores, and earning Kenya a bunch of travel alerts that threaten to undermine Mombasa’s tourist credentials. But in my experience at least life in the city goes on as if nothing ever happened. I felt safe and welcomed – including in my native tongue by a white-robed gentleman calling himself Mr. Giraffe (he was really tall) who was just finishing his morning prayers when I entered his store and upon learning where I was from greeted me with a big smile and extremely well pronounced “dzień dobry.” The experience was later repeated at a Maasai market near my hotel where I was greeted in Polish by friendly warriors Mark and Winstone originally from Amboseli area, which is my favorite place in Kenya (see: elephants). It was a déjà vu from Tunisia, where my countrymen visit in full force and I can have a whole conversation with street vendors in Polish. Clearly Poles are venturing further and further afield and exploring the riches of Kenya. 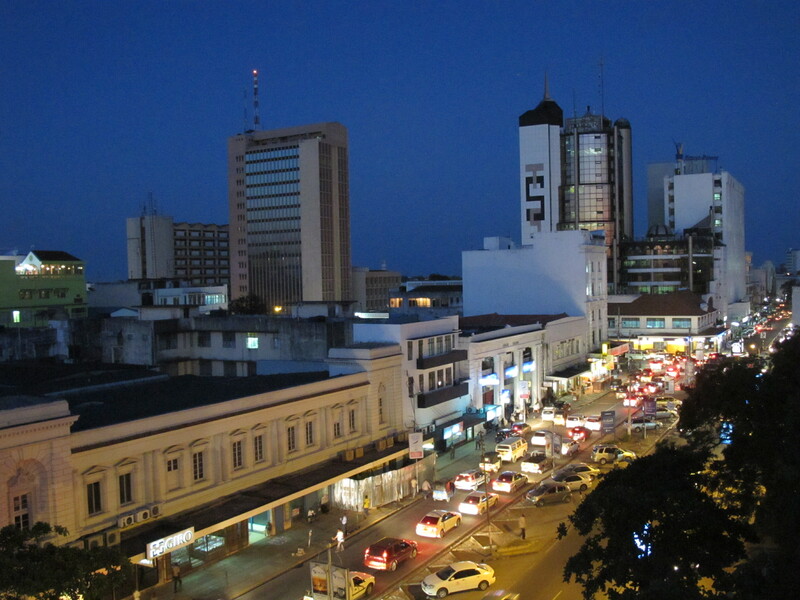 I love personalized customer service so I’m sure I didn’t bargain as hard as I could have, doing my part to support the local economy =) Shukran, ashe oleng, asante sana, dziękuję – thank you Mombasa! Hi Ania, I’d love to have one of those stenographs! Love old gadgets. 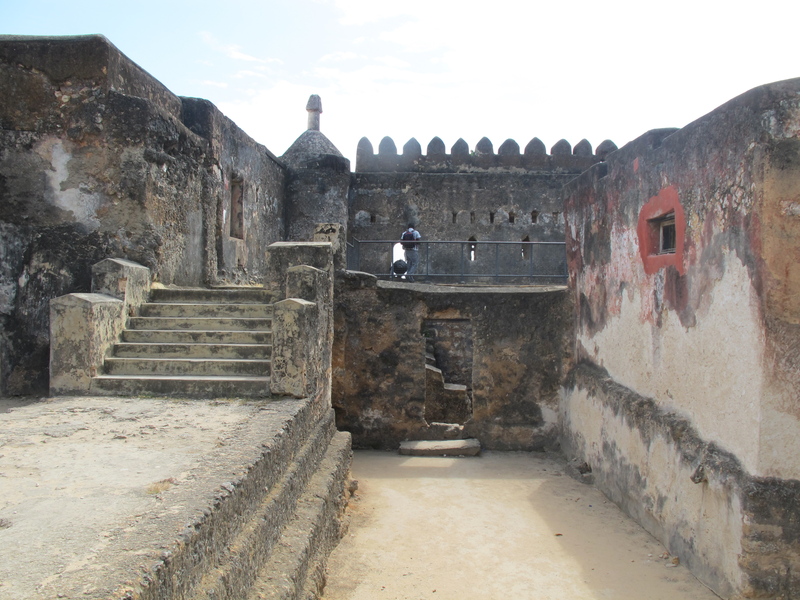 Intresting history about Mombasa, especially the intertwining of religions. Glad you enjoyed it! If you’re interested in stenographs, there are tonnes of them on ebay – and they are not expensive. Stenograph viewer on the other hand can be a bit pricey because pretty much they are all antiques (I’m still looking for a bargain one =) but even if you don’t have one, you can appreciate the photo. Get set of pictures. Nice work. Thank you so much, I’m glad you enjoyed them!